The posterior tibialis muscle is found deep in the calf and crosses through the inside arch of the foot. The tendons of this muscle look somewhat like fingers extending to six main sites of attachment which are perfectly designed to move the foot in and downward (inversion and plantar flexion of the foot). Left to right: Right Posterior tibialis muscle; Plantar side of the right foot with posterior tibialis tendon attachment sites. When under excessive stress the posterior tibialis muscle will throw foot mechanics out of kilter and as a result the body will call on the upper body for support and balance. Symptoms of an overly worked posterior tibialis muscle may present issues in the reflexes associated with the kidney, adrenal, and bladder. Contrary to what many believe the posterior tibialis muscle does not hold the arch in place. 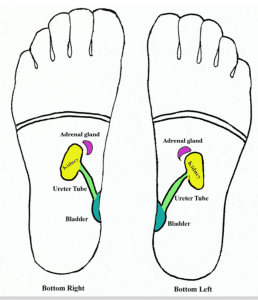 Its function is to move the arch of the foot. It also acts as a spring and shock-absorber as weight is transferred from the outer foot to the toes. This muscle works in tandem with 12 other long foot muscles* to manage weight as we take one step or run. 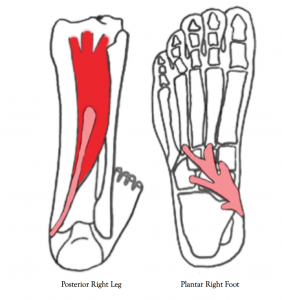 The successful performance of certain athletic activities are determined by the strength and capability of the posterior tibialis muscle to assist the arch of the foot to spring and shock absorb. However, excessive weight and repetitive activity may create irritation to the posterior tibial tendon where it attaches to the navicular bone and eventually lead to a condition called Accessory Navicular syndrome. The posterior tibialis has a strong tendon attachment to the navicular bone and the performance of the activities listed above require an excessive amount of power from this muscle and tendon. For instance the posterior tibialis provides power to the swimmer to successfully propel and flip against the pool wall, to the gymnast bounding and landing from heights of 6-8 feet, and to the constant pointed toe and contracted arch of the ballet dancer. Whenever there is extreme demand on a muscle the body will produce a callus (internal and/or external) to reinforce strength at the site of tendon attachment. The first sign of a developing accessory navicular is redness at the bony site of the inside of your arch- and may or may not be accompanied by a blister. If the event that caused the redness continues the body will signal the brain to build tissue at this site to prevent the tendon from fraying and detaching. Another indicator the navicular is over-developing is a visual protrusion of the bone. Navicular identification on the arch of the right foot. Chronic inflammation is the cause of this afflicted bone and tendon. Without rest the tendon of this muscle will continually recruit fiber development. In order to prevent these accessory fibers from hardening and eventually, occifying ( turn to bone) it is necessary to take time away from the activity to encourage the fibers to heal. An overly developed navicular is the body taking care of itself by reinforcing strength at the site of it’s attachment. As long as the activity is practiced there is a need for the body to accessorize the tendon where it meets the bone to meet the demand of the sport. 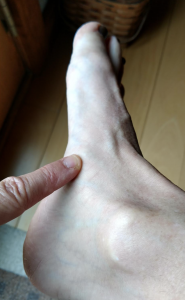 Often accessory navicular pain and further development can be managed and quelled with a combination of massage and passive foot mobilization techniques (i.e. Structural Reflexology). For best results and to avoid the risk of increasing inflammation it is important to reflex and massage the posterior leg muscle rather than work directly on the site of the tendon/navicular/reflex. Being informed about an accessory navicular will clarify it’s onset and avoid further damage to the posterior tibial tendon and navicular. The key is to keep the integrity of both in tact and not to rush into a panic-made decision to have this accessory bone removed. In most cases this is not necessary and the surgery itself may leave other debilitating ramifications. To read more click Put Your Best Feet Forward. 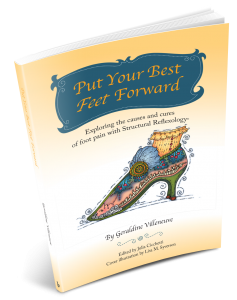 Click Structural Reflexology® For scheduled classes to learn skills to prevent and relieve foot pain and to understand how foot structure and foot reflexology are inter-related.